A San Diego homeowner in the Rancho Penasquitos area were planning on a complete pool remodel. Along with a new home electrical solar and swimming pool solar they wanted to update the pool equipment. We scheduled a service call to look at the pool and spa equipment so we could put together an estimate for the homeowner. Options for replacing the different pieces of equipment were included in the quote. Pricing for installing a new pool heater, a new pump and automation was discussed with the customer. After the new pool equipment was agreed upon the job was quickly scheduled. To begin the equipment replacement we turned off the breakers to the pool equipment. Our pool equipment installation team began with removing the old equipment. 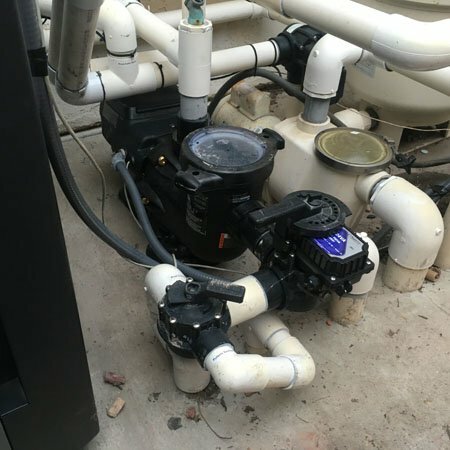 A Pentair Whisperflo pool pump was removed. Also removed was a MiniMax 400 swimming pool heater. Lastly the intermatic time clock for the circulation pump was taken out. The old heater and pump were set aside to be recycled. At ProTouch we do our best to recycle old products whenever possible. 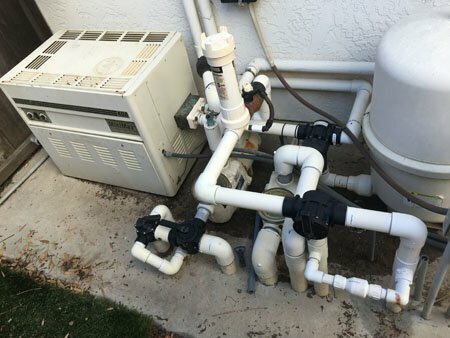 The existing Pentair SMBW pool filter was in good condition and not replaced. After we removed the old pool heater a new Raypak 406A 399,000 btu heater was installed. 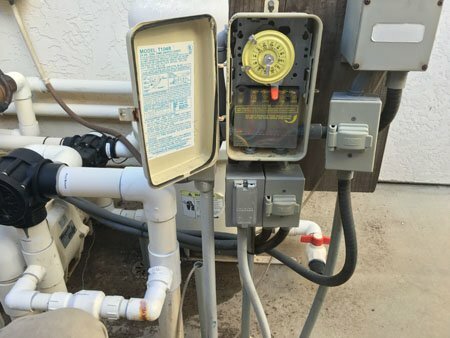 The gas line, electrical and plumbing were connected. Then the high efficient pool pump was installed. 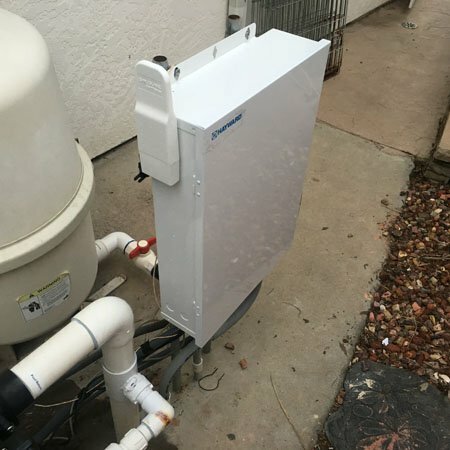 A Hayward EcoStar variable speed pump was then installed. 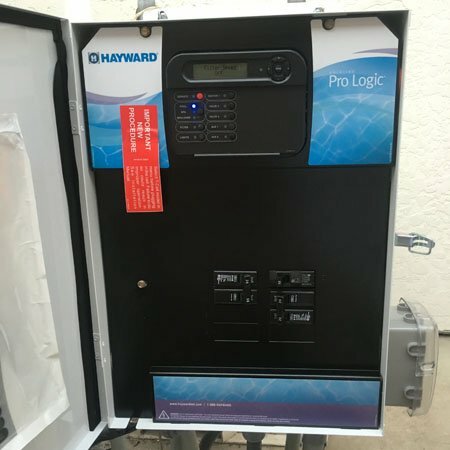 Lastly a Hayward ProLogic four function automated controller was installed. A handheld, waterproof, wireless remote was added to the automated pool system. Once the equipment installation was completed we programmed the controller. 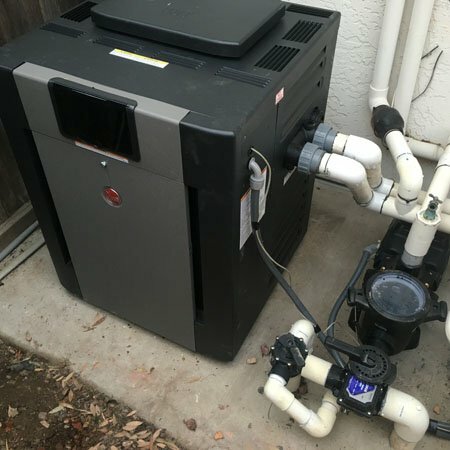 The programming included the different speeds for the circulation pump. Pool and spa light settings along with the heater temperatures were also included. The Rancho Penasquitos swimming pool owners were very happy with the equipment upgrades.